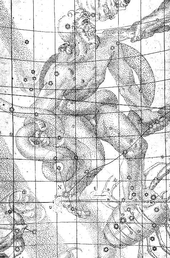 ^ Westman, Robert S. "Kepler's Early Physico-Astrological Problematic," Journal for the History of Astronomy（英語：Journal for the History of Astronomy）, 32（2001）: 227–36. ^ Using Tycho's data, see 'Two views of a system' 網際網路檔案館的存檔，存檔日期2011-07-21. ^ Kepler, Johannes. Hardie, Colin, 編. De nive sexangula [The Six-sided Snowflake]. Oxford: Clarendon Press. 1966 . OCLC 974730. Kepler contended that rotating massive bodies communicate their rotation to their satellites, so that the satellites are swept around the central body; thus the rotation of the Sun drives the revolutions of the planets and the rotation of the Earth drives the revolution of the Moon. In Kepler's era, no one had any evidence of Jupiter's rotation. 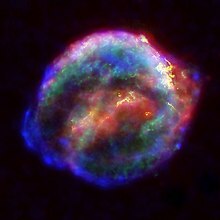 However, Kepler argued that the force by which a central body causes its satellites to revolve around it, weakens with distance; consequently, satellites that are farther from the central body revolve slower. 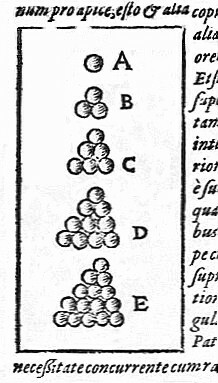 Kepler noted that Jupiter's moons obeyed this pattern and he inferred that a similar force was responsible. He also noted that the orbital periods and semi-major axes of Jupiter's satellites were roughly related by a 3/2 power law, as are the orbits of the six (then known) planets. However, this relation was approximate: the periods of Jupiter's moons were known within a few percent of their modern values, but the moons』 semi-major axes were determined less accurately. ^ The opening of the movie Mars et Avril（英語：Mars et Avril） by Martin Villeneuve（英語：Martin Villeneuve） is based on German astronomer Johannes Kepler’s cosmological model from the 17th century, Harmonices Mundi, in which the harmony of the universe is determined by the motion of celestial bodies. Benoît Charest（英語：Benoît Charest） also composed the score according to this theory. ^ Arthur I. Miller（英語：Arthur I. Miller）. Deciphering the cosmic number: the strange friendship of Wolfgang Pauli and Carl Jung. W. W. Norton & Company. March 24, 2009: 80 [March 7, 2011]. ISBN 978-0-393-06532-9. ^ HM Nautical Almanac Office. 1631 Transit of Venus. June 10, 2004 [August 28, 2006]. （原始內容存檔於2006年10月1日）. ^ Quote from Carl Sagan, Cosmos: A Personal Voyage（英語：Cosmos: A Personal Voyage）, episode III: "The Harmony of the Worlds". 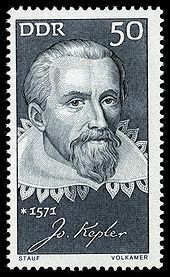 Kepler was hardly the first to combine physics and astronomy; however, according to the traditional (though disputed) interpretation of the Scientific Revolution, he would be the first astrophysicist in the era of modern science. ^ Eggenberg Palace coin. Austrian Mint. [September 9, 2009]. （原始內容存檔於2011年5月31日）. ^ Ng, Jansen. Kepler Mission Sets Out to Find Planets Using CCD Cameras. DailyTech. July 3, 2009 [July 3, 2009]. （原始內容存檔於2009年3月10日）. 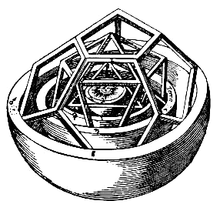 Schneer, Cecil: "Kepler's New Year's Gift of a Snowflake." Isis（英語：Isis (journal)）, Volume 51, No. 4. University of Chicago Press, 1960, pp. 531–545.